priorities described in the State of Louisiana Homeland Security Strategy. Each priority is linked to the associated target capabilities that will facilitate its accomplishment and to the training and exercises that will help obtain or validate those capabilities and address that priority. 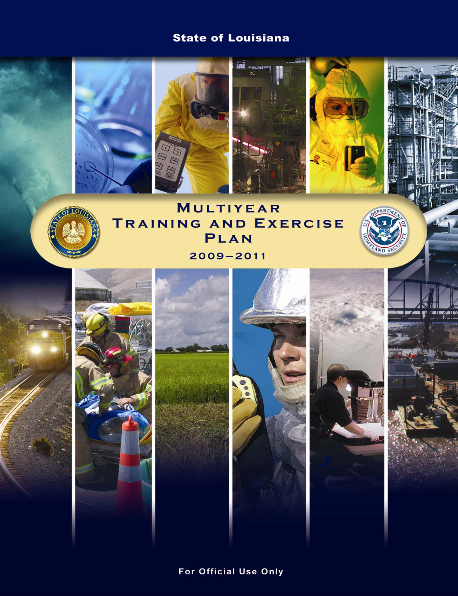 The Louisiana Multiyear TEP includes the training and exercise schedule, which provides graphic illustration of proposed activities for the years 2009–2011. It represents the natural progression of training and exercises that should take place in accordance with the building-block approach. incident, should be instructed not to respond. applicable). Safety controllers ensure that all activity is executed within a safe environment.